Jacques Pépin is world renowned as the host of his acclaimed and popular cooking programs on public television, and as a prolific author, respected instructor, and gifted artist. Recently, Pépin was awarded the highest honor by the French Government and holds the title of CHEVALIER DE L'ORDRE NATIONAL DE LA LEGION D'HONNEUR. 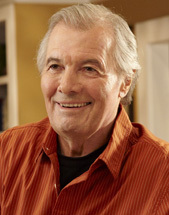 Pépin is the host of many popular public television programs, including his latest series Jacques Pépin: More Fast Food My Way, premiering in October, 2008. Featuring recipes for fast, healthy meals, this will be the twelfth series hosted by Pépin and produced by KQED Public Media in San Francisco. His memoir, The Apprentice: My Life in the Kitchen, was published by Houghton Mifflin in 2003 and in paperback in May, 2004. Pépin’s most recent book, published by Stewart Tabori & Chang in April 2007, is a visual biography, Chez Jacques: Traditions and Rituals of a Cook. He is also a proud grandfather of his daughter Claudine’s first child, Shorey. Pépin shared the spotlight with Julia Child in an earlier PBS-TV series that still is shown occasionally on public television stations. This twenty-two show series, Julia and Jacques Cooking at Home, was the winner of The James Beard Foundation’s Award for Best National Cooking Show—2001, and the duo received a 2001 Daytime Emmy Award from The National Academy of Television Arts and Sciences. There is a companion cookbook to the series he did with Child and also to two earlier public television series he co-hosted with his daughter, Jacques Pépin’s Kitchen: Encore with Claudine (1998) and Jacques Pépin’s Kitchen: Cooking with Claudine (1998). Pépin is the recipient of three of the French government’s highest honors: he is a Chevalier de L’Ordre National de la Legion d’ Honneur, Chevalier de L’Ordre des Arts et des Lettres (1997) and a Chevalier de L’Ordre du Mérite Agricole (1992). The Dean of Special Programs at The French Culinary Institute (New York), he also is an adjunct faculty member at Boston University. He is a founder of The American Institute of Wine and Food, a member of the International Association of Cooking Professionals, and is on the board of trustees of James Beard Foundation. He and his wife, Gloria, live in Madison, Connecticut.